People are often hesitant to use hearing aids because of the stigmas associated with hearing loss. Lyric can provide a simple, no-hassle solution. How Does the Lyric Work? Lyric is a digitally enhanced, analog hearing device that fits inside the ear canal and is intended for extended use. It works by enhancing ambient noise in the most natural way possible. It is placed in the ear canal right where the sound is captured. Ambient noise travels past the outer ear and toward the eardrum where Lyric can enhance it due to its proximity to the tympanic membrane. Lyric also helps reduce the chances of users experiencing the occlusion effect—a hollow or distorted version of their own voice due to low-pitched sound trapped between the eardrum and traditional hearing aid. The Lyric hearing aid is one of the most user-friendly devices on the market. No longer do patients have to worry about removing their device to sleep, shower, exercise, or talk on the phone. Patients can also enjoy the use of external headphones or hearing protection. 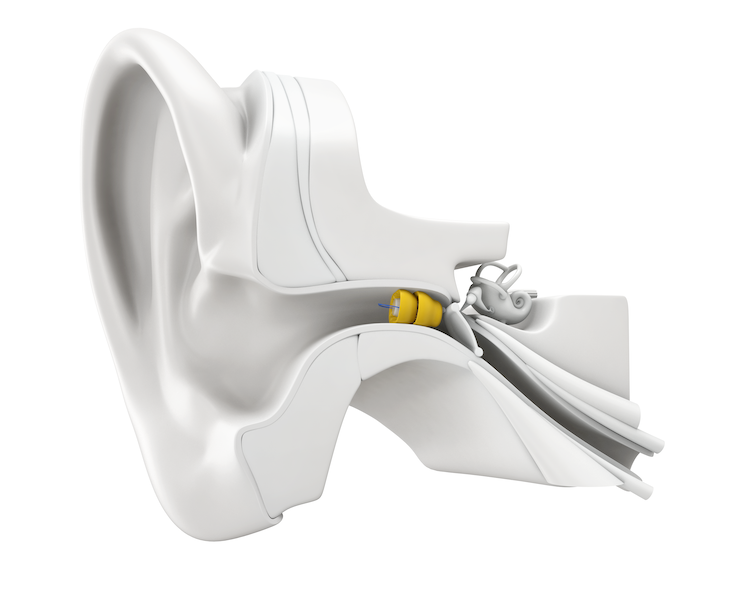 Also, Lyric’s components are small enough that they will not set off any metal detectors, and because it’s inside the ear canal, wind noise is significantly reduced. Quite simply, Lyric gives people the freedom to live their life without constantly being reminded of their hearing loss. The device is digitally programmable by our audiologists for optimal tone and volume. Patients will be given a tool that can adjust the volume level through six different levels. This can be beneficial for when they want to mute the devices, such as during a loud plane flight or before going to sleep. Is Lyric Right for Me? Lyric is designed for patients with mild to moderately severe hearing loss. Do you find it difficult to keep track of conversations in large crowds? Do you often miss words or whole phrases from phone conversations or while watching television? Lyric can be the solution to bring your audible world back into focus. Lyric is not a surgically implanted device. During your comprehensive hearing aid evaluation, our audiologists will examine your canal to see if it is healthy enough for hearing aids. We will then perform an audiogram to determine the fitting range for your device. The whole fitting process can be done in-office with a simple measurement and insertion before calibrating the device. Patients will walk out of the office with clear, enhanced hearing. What Can I Expect With the Lyric? The Lyric device can be worn for days, weeks, or even months at a time. Should the battery life run out on your Lyric, simply return to Associated Hearing Professionals, and we will replace the hearing aid for you. Additional maintenance should not be needed, and daily insertion and removal are not required. Experience the joy of hearing sounds that you never knew were missing—gentle drops of rain on the roof or the rustling of dry leaves in the wind. Patients are typically in and out of the office with a new Lyric device in about an hour. Fill out our contact form today to schedule your appointment. We’ll help determine if you are an ideal candidate. With Lyric hearing aids, you’ll wonder how you ever lived without this innovative, seamless device.